I know lots of my Loyal Readers use huge planners filled with daily pages and lots of writing space. But my old bones just can't carry that much. What's a plannerd to do when your planner just doesn't have enough space to write the things that are happening today? Instead of cramming everything on your weekly spread or carrying mounds of heavy daily pages around, try some of these tricks! I use my Projects section to deal with ongoing, big planning. Using a Projects section frees up space on the weekly spread. Say I need to work on a Valentine's Day party. I might have a project with all the tasks in it. Deadlines, like sending out invites two weeks in advance, go on the weekly spread. But other, lesser tasks just go in the Projects section. TIP: If necessary, put a reminder to check on Project tasks (like "P - Valentine's") on your weekly spread. In a different sort of example, I use a daily goals chart to in my Projects section to list daily goals that might or might not happen, like doing the laundry. Unless there is a special need (like a karate uniform that must be washed by tomorrow), normal household chores can go in your Projects instead of crowding your weekly spread. Daily dockets are great for busy days. I use them as needed. If you want to find out how I use them, read Features of a Successful Daily Plan. Sometimes, I don't need a fancy, fully-prepped daily docket. Instead, I really just need some extra space to write. In those cases, I create an overflow page. An overflow page is different than a daily docket in several ways. 1. I don't move EVERYTHING from my weekly spread for the day to an overflow page, like I would on my daily docket. I only use the overflow page to ADD to the weekly spread daily entry. 2. 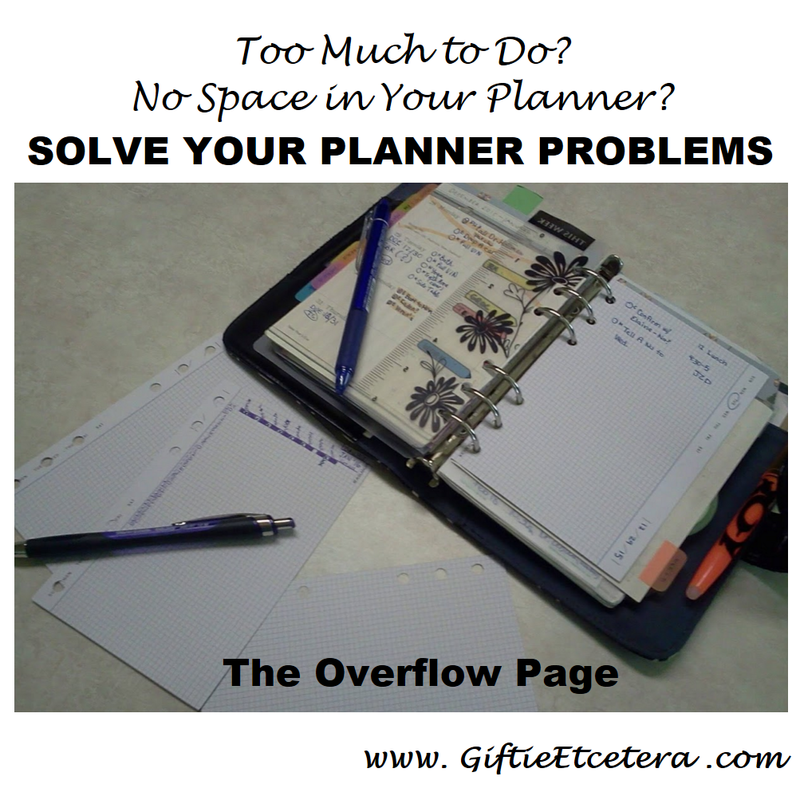 The overflow page is quicker to create. When the weekly spread gets full, I just pop in a blank overflow page for anything else that pops up. Boom...I'm done! 3. The overflow page does not have a standard set-up, like my daily docket does. Instead, it is completely just a dumping ground. A daily docket is a more specific PLAN. TIP: Keep several overflow pages in the back of your planner. I use a Franklin Covey compact planner. My weekly spread is created from the Paris Is Always a Good Idea 2016 Weekly Planner. I make my daily dockets using Quo Vadis 2016 Planner Refill. I made my overflow page and daily goals chart shown in the picture using AT-A-GLANCE Planning Note Cards. I love weekly spreads and daily dockets. But, sometimes, there needs to be a compromise in between. Overflow pages are that compromise. I know a lot of people are making inserts to their planners when they don't offer a lot of room to write things down. Thanks for the tips! You know I used to use Franklin Covey--don't know why I got away from it. Thanks for this tip--I just started using a planner again to get myself in the groove for my new career. Nice to meet you. Your photos brought back memories. I used a Franklin Day Planner for years (before they were Franklin Covey). I never went any place without it! I use an online system now, but sometimes I think about going back as there is something about holding that planner. Your plans seem so concrete! Blessings as you plan out your New Year! Thanks for the tips and sharing at Funtastic Friday! I always love planner tips. Thanks for sharing with Small Victories Sunday Linkup. Pinning to our linkup board and hope you found some great posts to visit this week! I usually use a daily page, but sometimes if i dont have appointments, i will just use a sheet of paper to catch all the things i need to do that way. So far i have not had such a full week that i had to use an overflow. I try my best to split tasks between the days.